Alles Im Fluss provides workflow technology to aid subdivision modelling. At the core lie mechanisms to easily draw polygon strips and filling sections. The tools provide you with control to refine the surface flow. Currently a plugin for Autodesk ® 3ds Max ® is available. Easily extend edges and cap surfaces with quads. Basic Operations All functionality is provided by a context-sensitive brush tool that operates on editable-polys. When active, click or click-drag to trigger the different tools depending on the active sub-object mode. Activated replay causes the last or loaded path being reapplied to the new stroke (paths can be stored and loaded). When refine is enabled, the end of the action provides you with an options dialog to change the outcome for your needs. See the support section how to generate the main toolbar (or bind the functions to keys, or other menus). In 3dsmax by default the 1,2,3,4,5 keys are assigned to switch to the different sub-object modes directly. CTRL: Activates selection mode, allows you to paint selections. SHIFT: The stroke gets constrained to the major axis of the current coordinate system (paint straight lines or tweak along major axis). If you move the mouse back and close to the constraint point, you can change the axis. Tool Features Workplane The draw and tweak tool make use of the workplane, which is shown in left lower corner of your screen. The orientation is provided by the active reference coordinate system (RCS), and the plane is chosen based on the angle towards the viewer. When you don't change the RCS nor view direction, you can cycle between other planes using the constrain axis system of 3dsmax, which by default is mapped to the F5-F8 keys. Once you change view or RCS too much, it will snap back to the plane that is facing the view the most. The draw and tweak tool each memorize the RCS they were last used with. Tweak Quickly tweak (default is move) vertices independent of their selection state. The brush hardness (SHIFT + ALT) will affect how softly the vertices are moved by the brush. You can use SHIFT to constrain movement along a major axis. Tweak Refine Options The activation of the refine mode allows you to use the current vertex selection as mask: only selected vertices within range will be affected by operations. Tweak Transform Cycle You can cycle through all transform modes by triggering the transform cycle: Move, Rotate, Scale 2D, Scale 3D. Depending on mode a different gizmo is drawn around the brush. Draw With the drawing tool you can paint polygon strips freely on the workplane, start from open edges (or selected faces for extrusion) and connect open edges. The brush size influences the geometry for free strips and how many edges are picked up when extending open edges. Alternatively select the series of open edges manually (for example with CTRL). Face extrusions are triggered depending on view-angle towards the face group. An outline appears when you can extrude the face group. If a path appears, you can extract it for replay. Use selection-lock (default SPACE) to enforce path extraction mode. Path extraction for replay: When in face mode, it enforces path extraction mode independent of view-angle towards face cluster. You can extract a path from any geometry. Manual point insertion: When starting a new stroke and selection-lock was active, you have to insert points manually with CTRL, and during refine not all options will be available. Due to implementation restrictions, just pressing CTRL will not show a change, you also have to move the mouse a little. 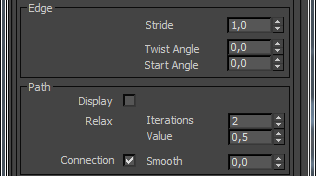 Draw Refine Options When refine is active, feel free to use ALT + Middle Mouse, Middle Mouse and Mouse Wheel to change view and inspect the shape (be aware currently other ways to change view, such as zoom, pan, orbit mode via icons etc. will cause an abort). 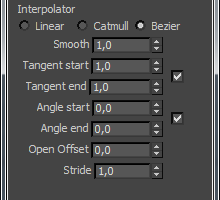 Simply play with the values, though many of the interpolation-related values will only show an effect when the "Smooth" parameter is set greater than zero. Do not use undo while in refine, as it will abort the entire operation. If several options are disabled (greyed out) it means the manual insertion was active for the stroke, triggered by selection-lock at stroke begin. Allow Edge Connection: If the end position of your edge stroke hits an open edge, you connect to it. Enabled by default to allow easy connections. Smooth: Defines how much the interpolation should be used, 0.0 disables it, 1.0 means that the stroke path is purely based on the start and end orientation. Twist Angle: Set the rotation towards the end of the path. Start Angle: Only when making free strokes, you can also change the starting angle. Relax Iterations: Instead of using the path you paint directly, you can control how much smoothing should be applied to it. Relax Value: During relax each path point is blended this much towards the average of the previous/next point. Weld: A bit experimental, but you can weld the outer vertices of a strip with open-edges by the existing mesh. If outer is used, then only the outermost vertices of the strip are affected, otherwise in-between vertices also get moved along. Range: Set to 0 to disable weld snapping, otherwise set the weld distance. Draw Replay You can replay the final outcome of the last, extracted or loaded stroke to new geometry. The orientation depends on the draw mode. It is relative to workplane and drag direction (free stroke), starting edge and face (edge extend), or face group matrix and view direction (face extrusion). Currently you cannot further refine replayed strokes, though if refine is active the path's size is affected. Be aware that "undo", "redo", "abort" have no influence on the "last" painted stroke, so make sure to save such paths to disk directly using the main settings menu or use path extraction when in face mode. However, it is safe to replay the same path many times. 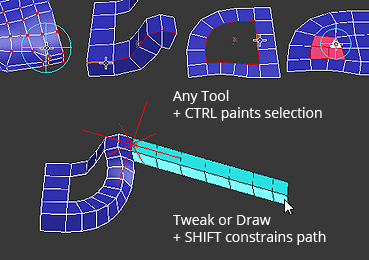 Replaying non-extrude with extrude paths and vice versa is currently not recommended. Draw Replay and Active Refine If Refine is activated and you trigger a replay, the path is scaled relatively to the first edge. Say the original path had a starting edge widht of 1 and the edge on which you apply the replay is 2, the replayed path will be twice as big. Draw Transform Cycle The transform cycle allows you to "flip" the local X-axis (sides) of the active path for the next replay action. Either trigger while stroking the replay, or simply click it prior the action. Grid Cap Cap borders with this tool, which tries to fill mostly with quads. The flow of the surrounding surface is taken into account to generate smooth transitions. Grid cap works best with a regular grid or when provided 4 corners (vertices with more than 2 faces), otherwise it will try to derive four corners. Avoid concave outlines, as the result surface might intersect itself. When the algorithm fails, it will ask whether a default cap should be performed. Interpolation is performed in the directions of the parametric rectangle (U and V). The final point is a blend between those. Interpolator: Three different interpolators are provided, each resulting in different path flow. Use Corner Tangents: Causes the tangent angle of corners to be preserved, otherwise the surrounding strip tangents are used for interpolation. Weight: By default the weight for the U/V blend is based on a distance-based heuristic. By activating you can manually give more weight to U (-1) or V (1) or use the average of both (0). Tangent U in/out: Influence of the tangent on the surface in U direction. The checkbox let's you lock symmetric values. Tangent V in/out: same as above, but V direction. Pole U: Unless a perfect grid can be generated, a pole point is inserted (resulting in a triangle or rotated quad). With these coordinates you can influence where the pole should be positioned. From certain numbers onwards it will not make a difference anymore due to individual grid dimensions. -1 tries to center the point. Pole V: same as above, but V direction. Surface Relax You can relax vertices within the clicked face selection and they will slide along the shape of the original surface. 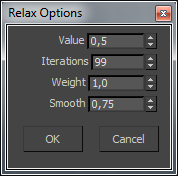 Value: How much the average should influence the vertex per relax iteration. Iterations: The number of relax iterations. Weight: Blend weight between the original point and the final relaxation. Smooth: Treat the original surface as curved surface based on vertex-normals. A low value will cause vertices to stick to the original triangles, higher values can cause vertices to float or sink depending on surface angle. Selection When CTRL is pressed, you can paint selections. The brush represents a 3d sphere around the hitpoint with the mesh, hence you can only select what is connected and within radius of the hitpoint (3dsmax's Window/Crossing option is respected). If the starting primitive (highlighted) is already selected, you erase selections, otherwise you add. Starting the drag outside the mesh will cause rectangle / circle / polygon selection depending on current max setting (not all of 3dsmax's modes are re-implemented). Clicking outside the mesh will deselect everything . General Settings Some of the settings can be changed without using the refine options. A very useful option is saving and loading drawn paths to/from files. Use Pressure: Wacom® compatible pressure sensitivity can be enabled for the brush hardness. Brush Size: Influences size of free strokes, or edges part of extend strokes when drawing, or influence for tweak, or selection paint brush. Brush Hardness: Affects tweak influence, see the tweak tool section for details. Mode:Set the draw tool mode to either create a new stroke, or replay a previous/loaded one. Load Replay: Load a path from disk ready for the next replay stroke. Save Replay: Save the last drawn path to disk for future replays. Stride, Angles, Relax...: See the draw refine options. Display: Allows you to display the unrelaxed path while drawing. Auto Smooth: Runs auto-smooth with the given angle on the new faces created by draw. Smooth Angle: Angle for auto-smooth. 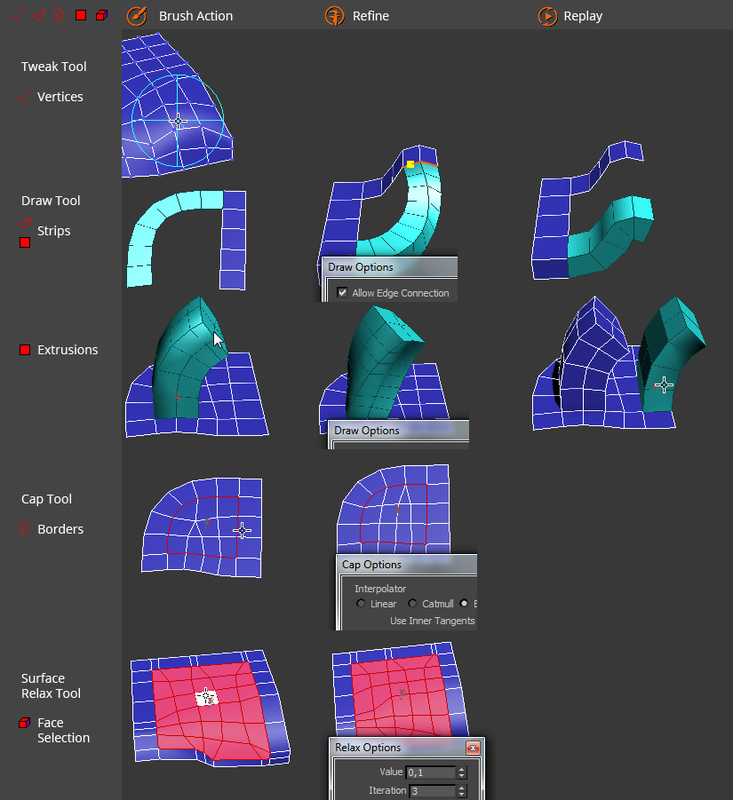 Weld Vertices: Weld vertices of drawn geometry with original mesh, see draw tool refine options. Face Selection: The new faces of the drawn strip geometry are by default added to the current face selection. You can also prevent any changes to the selection to happen, or set the new geometry exclusively as face selection (Last Strip). Collision Collision allows you to paint on other objects. You can add selected nodes to the collision system, or clear all nodes. While added, it is crucial the topology is not changed (the mesh), however, you can still move, rotate or scale the objects freely. When active it affects both tweak and draw tool. When using the tweak tool, orthographic viewports are recommended for better results. Add Selected Nodes: The selected nodes are added to the collision system. Ideally only use objects that you treat as "frozen" and that are easily turned into triangle meshes. Clear Nodes: Empties the collision system. Collision Active: Activates the collision system for the draw and tweak tool. Collision Align: When drawing strips, it aligns the edges with the surface normal, edges are aligned with workplane. Coll. Offset: Change the distance to the surface hitpoint, increase for floating, decrease for sinking into the surface. Back Offset: Offset the ray start position, might want to play with this if you don't hit surfaces or wrong ones. Register: When you have purchased a license, you can enter your registration info here, which will remove the reminder popup screen with the next 3dsmax restart. Visit Website: Should bring you here. Uninstall: Deletes script icons and removes plugin from plugin.ini, then brings up the installation directory in the explorer, which is safe to delete after closing 3dsmax. Your path and registration file are preserved in plugcfg. Modding For those proficient in maxscript and who want to tune for their own workflow: A lot of the user-interaction logic is coded in maxscript, the files (.ms/.mcr) are provided in clear text and therefore you can create new macroscripts, make changes to UI, control logic and so on. An overview on all plugin commands is provided with the modding.txt in the installation directory. Be aware that you are completely on your own with making any changes here. While you can make such changes public on your own, respect the EULA and do not redistribute any other non-maxscript files, but refer to the original product. Autodesk® and 3ds Max® are registered trademarks by Autodesk, Inc.